With more choice than either Canon or Nikon can currently offer, Sigma has an enviable range of telephoto zooms. Given the wider zoom range and a $1,659 price tag that comfortably undercuts the Nikon and Canon 80/100-400mm f/4.5-5.6 equivalents, this one sounds particularly tempting. Not only does this full frame lens boast an ultrasonic type (HSM) AF motor but it also has optical image stabilization, which Sigma claims allows shutter speeds of up to 4 stops slower than a non-stabilized model and a useful close focus capability of 1:3.1 set at 200mm. While the large 95mm filter size is rather restrictive price-wise (with polarizers especially), the optical construction is impressive with four low dispersion glass elements out of a total of 22 in 16 groups. Measuring 104.4x219mm and weighing 1,970g this lens is compact if somewhat weighty suitable for both full-frame and APS-C type (DX) DSLRs where on the latter it’s the equivalent of a 75-750mm. 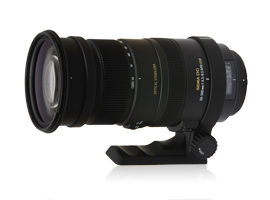 The Sigma APO 50-500mm f4.5-6.3 is one of the sharpest of its type measured on the 36MPix Nikon D800. On a 24-MPix Nikon D600 the Sigma APO 50-500mm f4.5-6.3 performs very well indeed. 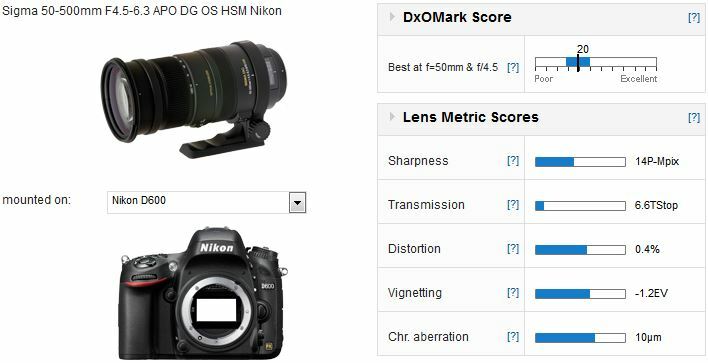 Achieving a DxOMark score of 20 points, the lens is one of the highest scoring super-telephoto zoom that we’ve seen. Although the sharpness varies a bit over the zoom ratio (it performs best at 50mm) the 14P-Mpix score places this lens very close to the Nikon 80-400mm rivals for sharpness. An average Transmission of 6.6T is slightly disappointing (it’s measured at 5.3-7.5T across the zoom range) but figures for distortion, vignetting and CA are all very good for a lens like this. 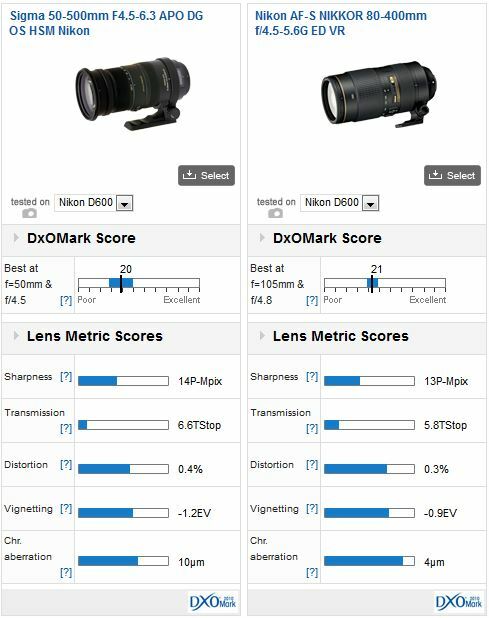 Compared with its direct rival, the newer Nikon 80-400mm f/4.5-5.6 ED VR, the Sigma is on a par optically coming just slightly behind in the overall DxOMark score (which is a benchmarking exercise) but can boast slightly better sharpness overall. There is a caveat though. While the Sigma is better than the older Nikon version where it counts (at the tele-end), the improvement in sharpness over this new model is at the less useful shorter end of the zoom range. The new Nikkor is also brighter by around a half-stop throughout the equivalent zoom range, and it has slightly lower levels of distortion, vignetting and chromatic aberration. The Sigma might not have the build and outright image quality at the longer end of the zoom range of the premium marques, with Nikon’s own offering being recently redesigned and improved in lots of meaningful ways. But, given the extra versatility from the wider zoom and the savings of around $1,000 over the Nikon badged lens, the Sigma is hard to ignore.